★★★☆☆ Be the first to leave a review! 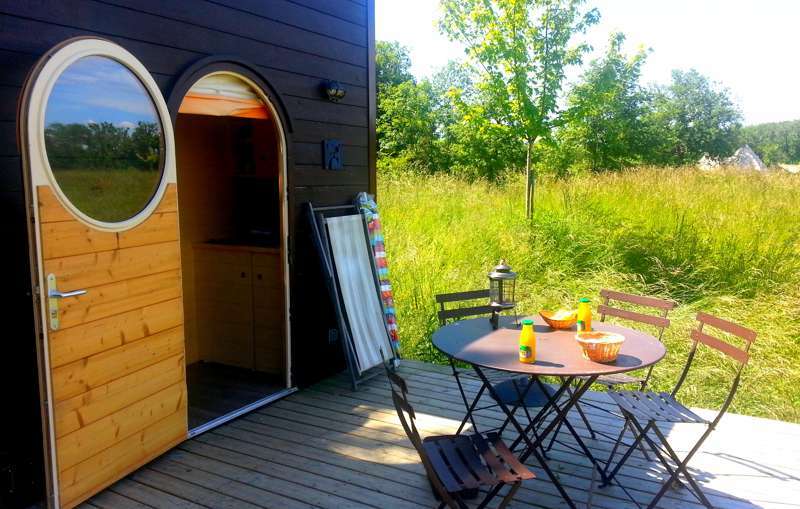 Our classy cabin is perfect for a holiday away from the modern world. You have your own private terrace with a heated jacuzzi, the perfect way to relax and listen to the birds sing in the trees around you. All the beds are made on arrival and we have a fully equipped kitchen with all the essentials you'll need for your stay. 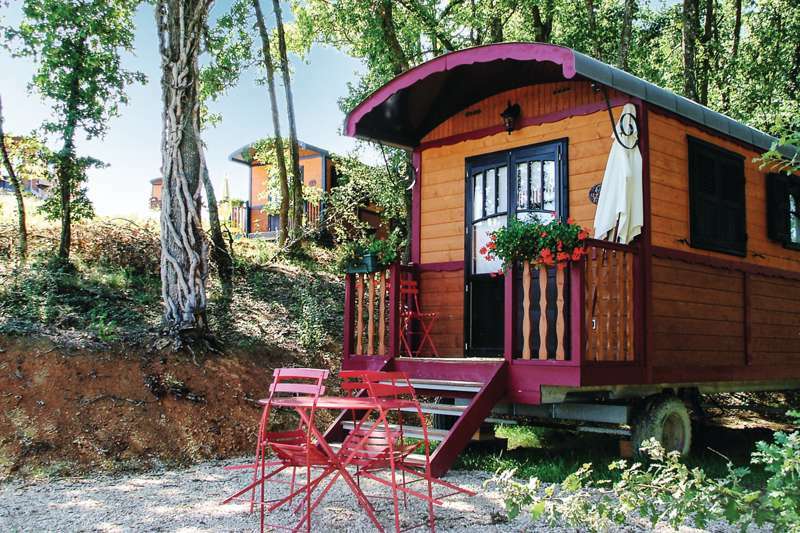 Our Carre d'Etoiles is a nine-square-metre cube, fully equipped and heated, and perfectly-sized for two. 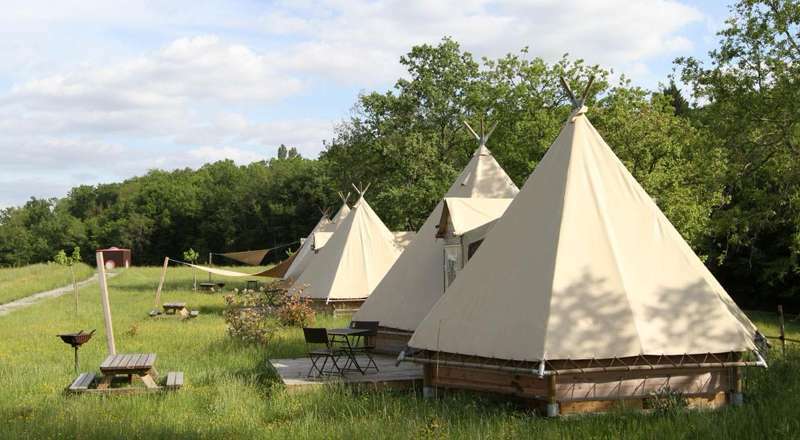 Book this Tepee, complete with 3 separate bedrooms, one with two double beds for couples, one bunk bed and once couch bed. The kitchen corner has crockery, filter coffee maker, kettle, microwave, fridge. We also provide you with fleece blankets but please bring your own sheets and towels. Our heated lodge trailer with double alcove bed, two single couch beds and one single trundle bed. All bed linen is included and the beds will be ready for when you arrive. 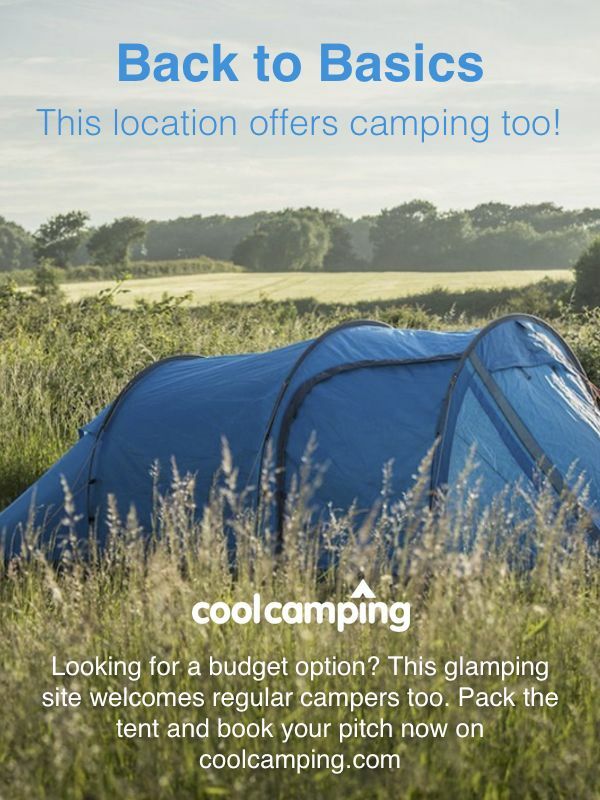 You have a private en-suite with toilet and shower and your own barbecue outside. For latest availability and best prices for Domaine d'Escapa, please use the Date Search above. Every accommodation type is a self-enclosed space with a shower room and washroom, an excellently equipped kitchen and a living and sleeping space (all bedding and linen provided). 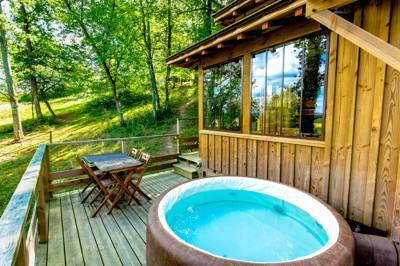 All guests have full access to a swimming pool, shared Jacuzzi, shared sauna (book from €9) and hammocks for use, while some of the tree-cabins have their own private Jacuzzis on their verandas too. A lake (with inflatable canoes and kayaks for use) and fishing permitted. There's a playground for children. Horses and ponies to pet, plus free range hens. This is a rural location, so it's light on big museums and attractions, but awash with excellent walking routes and quite roads for cycling. The surrounding towns – Auch, Mirande, Bassoues, Tillac – all have weekly markets and intriguing histories in their own right and a dotting of ancient churches and monuments, while the dungeon and 14th century castle in Bassoues (20km) is well worth a visit. To make the most of the vast open countryside, have a nose around the pamphlets in the campsite reception, with info on canoeing and kayaking, pony-trekking and tree-top adventures in the local forest park. Reception shop stocked with the basics (including ice-cream) and a small bar selling beer, wine, champagne and soft drinks (10am–7pm). Meal baskets are available for your kitchen; specialties include foie gras, lentils and duck cassoulet, goat cheese, apple and rhubarb pie and fondant for dessert. It's 5km to L'Isle-de-Noé where the magnificent riverside château hosts restaurant Le Tic Tic gascon (05 6206 4622) in the courtyard – guests eat under a light canopy in the open air. Well worth a visit (10am–11pm; meals are around €13). The nearest train station is in Auch, from where it is a ½-hour drive or taxi journey. 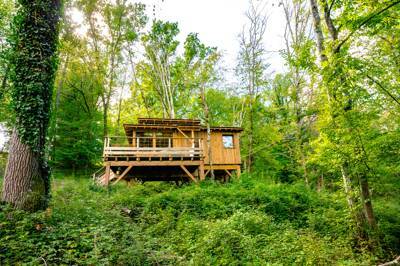 10 roulottes, 5 tipis, 3 standard stilted cabins in the trees, plus 3 stilted cabins with jacuzzis.